Consumer electronics retailer Best Buy has announced that they will be offering all Google Nexus S models for free in a limited-time offer that will last only for the day of 3rd August i.e. today. The Nexus S is a smartphone developed by Google and Samsung which essentially marries Google’s Android experience from their Nexus One smartphone with the innards of the Samsung Galaxy S. The phone has received great reviews but it hasn’t really been what you would call a “commercial success”. Google’s second experience smartphone is based on Android 2.3 “Gingerbread” – the latest version of Android for smartphones. It may not have a dual-core processor, but this is absolutely fine: most Android apps (even the Android OS itself) haven’t been optimized for dual-core processors yet, so the single core 1GHz Hummingbird processor, 512MB of RAM and the SGX 540 GPU that it has are more than adequate. The Nexus S also has a 5 megapixel camera on the back with a VGA resolution front-facing camera. It is the first Android device to support NFC technology. Also, let’s not forget that this phone comes with Samsung’s Super AMOLED display which is, as we all know, quite super. There are currently three Nexus S models available on-contract in America: models for Sprint, AT&T and T-Mobile and they are all part of Best Buy’s promotion today. Best Buy Mobile today revealed an exclusive one-day sale on Nexus S from Google phones valid on all carriers who support the device – AT&T, Sprint and T-Mobile. Customers can receive a free Nexus S phone, either as a new phone or an upgrade purchase, with two-year activation at all Best Buy, Best Buy Mobile specialty stores, and online at BestBuy.com/Mobile. Best Buy’s exclusive offer started at 11PM CST yesterday and will last till 11:59PM CST tonight. All three models are available for free with a two-year contract on the wireless carrier of your choice. 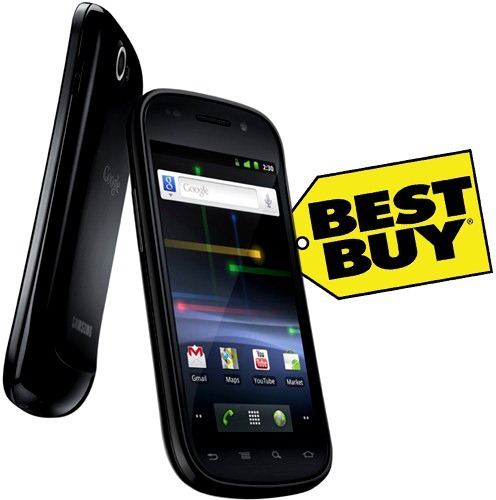 Best Buy is selling the phones from its retail stores or through their mobile website. Rumors about the Nexus S’ successor are popping up as it is expected to receive an upgrade this year. BGR reported over a month back on it, stating that the next smartphone from Google would be called the Nexus Prime. The phone is expected to launch later this year or earlier the next with features like a dual-core 1.5GHz processor, 720p Super AMOLED HD display and Android 4.0 “Ice Cream”. just google atttiphooneuunlockingis among the few sites that’s still able to ՍΝᏞΟᏟΚing AT&T phones after AT&T denied many cheap ՍΝᏞΟᏟΚing owners’access to their database. just google atttiphoneuunloockiingis among the fastest սոⅼοсking site for AT&T with no doubt.